A new line of round vacuum traction cups for press automation that are designed to grip securely and disperse oil when handling curved sheet metal body panels is being introduced by ANVER Corp. of Hudson, Massachusetts. ANVER Green Cups are molded from a hybrid NBR blend with a high-traction design that is optimized for operating in hot and oily environments up to 275°F. Suitable for use with high speed robotic pick-and-place sheet metal handling equipment, they provide fast attach and release and are designed to maximize grip and disperse any existing surface oil on stamped panels. Compatible with all popular end effectors, ANVER Green Cups are available in 65 mm, 85 mm, and 105 mm sizes in 50- and 60- durometers; with male disconnect or quick disconnect couplings. 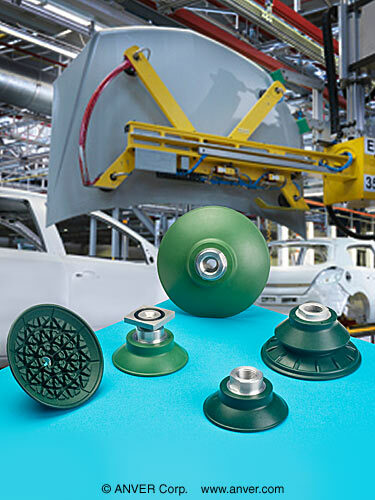 A wide variety of other vacuum suction cups are also available molded from different specialized compounds for a wide range of vacuum material handling applications.